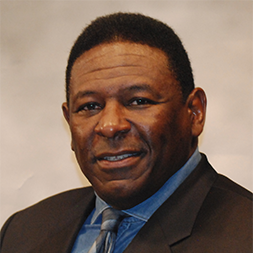 Jackie Slater played offensive tackle for the Rams for 20 seasons, breaking the record for the most seasons played for one NFL team. He was selected for the team during the third round of the 1976 NFL Draft after graduating from Jackson State University. By the end of his career, Slater had been selected to seven Pro Bowls, voted by the NFLPA as NFC Offensive Lineman of the year four times, and played in 259 games. He has also won the Bart Starr Man of the Year Award, had his jersey number retired, and was inducted into the Pro Football Hall of Fame in 2001. Slater is currently the offensive line coach at Azusa Pacific University in Azusa, California.